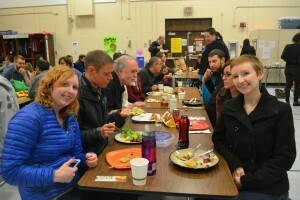 Compassionate Action for Animals hosts a big vegan Thanksgiving potluck every year. This event attracts anywhere from 100 to 150 people, depending on the weather and how well we advertise. This is a great community-building event. Attendees can try a lot of delicious vegan food, and it provides an animal-friendly counterpart to the traditional turkey-centric Thanksgiving celebration. Our how-to below uses Thanksgiving as an example, but you could adjust this for any holiday. Why not have a vegan 4th of July picnic potluck, or maybe a Superbowl Sunday event? We suggest aiming for a Saturday or Sunday before Thanksgiving. Potential attendees are likely to be in town and it does not compete with Thanksgiving evening. If your potluck is based around something less family-centric, like the Superbowl, then it may make more sense to have the potluck on the day of the event. Once you’ve picked your date, you need to find a venue. Consider location, transportation options, and the number of people you expect to attend. You’ll need seating for however many people you expect. 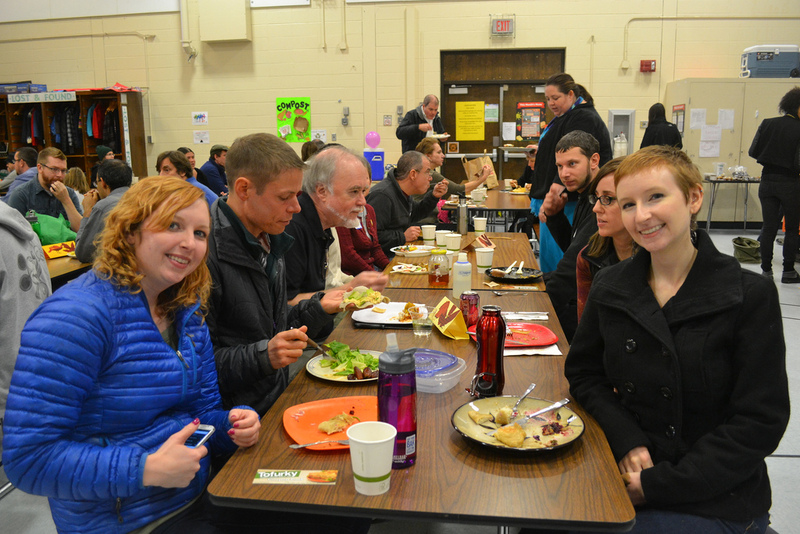 We typically have about 125 people at our Thanksgiving potluck. The best venues for these types of events are community centers or churches. Many churches are willing to rent out their communal space for a small fee, and they often have excellent facilities. If you’d like to avoid overtly religious decorations, consider Unitarian churches. They don’t display religious symbols in their spaces. A local university or college may also have an appropriate space, but they’re often more expensive than the other options, and they may have more rules about what you can do in their space. Besides space for people to sit, you’ll also want a few other amenities. First, there should be an obvious single entrance to the space. This makes it easy for you to set up a greeting table where people can sign in. Second, you’ll need additional space for putting out food. A room with just barely enough seating is not big enough. Finally, you’ll almost certainly want a kitchen of some sort. Even if you don’t plan on doing any cooking at the event, you’ll still want to be able to get water and maybe do some light dish washing. If you want to prepare food for the potluck, a full kitchen would be ideal. Once you have a location and a date, you can start advertising. We recommend that you start advertising at least 4 to 6 weeks in advance. First, put the basic information about the event on your website, social media, and in your email newsletter, if you have one. Mention it in at least two emails, one about a month before the event, and the other in the week preceding the event. It’s useful to have a place to collect RSVP’s such as Facebook, Meetup, or Eventbrite. In addition to collecting RSVP’s, it makes it easy for people who are excited about the event to help promote it by sharing the event and inviting their own friends. Keep people engaged by posting reminders and other content to the social media. You can ask people to participate by sharing recipes, telling you what they’re bringing, or asking for ideas about how to make the event better. You may also consider printing flyers and distributing these around town. A college campus can be a great place to post flyers. You can also post them at local co-ops, coffee shops, and veg-friendly restaurants. That all said, printed flyers are not likely to get that many people to attend; you can safely skip this step if you don’t have the time. Decorations can include fall-themed colors, photographs of happy turkeys, and slogans about compassion. For large potlucks, we ask attendees to bring their own plates and silverware. However, we still make sure to provide some as well. Whenever possible, we use washable or compostable items to reduce waste. Your venue may have their own composting service that you can use. Otherwise you will have to find a way to compost items. Many cities have non-profits or businesses that will rent a compost bin for the event and then pick it up. In Minneapolis, this service is provided by the city. If you’re expecting a large crowd, provide large amounts of hot water, coffee, room temperature water, etc. A small water boiler or home coffee maker won’t cut it. Fortunately, it’s easy to rent these items from an event rental company. Simply search for “event rental,” and you’ll find some options. Renting these sort of items for a single day should be cost less than $100 total. If you as the organizer are planning on cooking at the event, bring supplies for that as well. Lastly, don’t forget to bring some cleaning supplies, including rags and cleaning spray. If you need to clean dishes or pots, you’ll need sponges, dish soap, and drying towels. It never hurts to provide some extra food at a potluck. At a minimum, make sure to provide water for drinks. Providing coffee and tea is also ideal. Vegan food companies are often willing to donate some food to events such as these as a way of supporting your cause and advertising their products. Tofurky has offered lots of support for animal advocacy events, including our own. You might also consider asking a few volunteers to make specific foods or larger amounts of food to ensure that you have enough at the potluck. For example, at a Thanksgiving potluck, you might ask a few volunteers to make large batches of stuffing, mashed potatoes, and gravy. If your event venue has a full kitchen, do the cooking on-site to make things simpler. Check with the venue to see if they have pots, pans, etc. on-site that you can use. If not, make sure to coordinate with your volunteers to bring the necessary items. Setting up for a potluck is pretty simple. Arrange a few tables for food and drinks. Make sure to put out the plates, silverware, and napkins you brought at the end of the table, where the line will start. Then, put all the food on the tables. We ask people who come to our potlucks to bring a list of the ingredients that went into their dish. If they forget, we ask them to write it on a piece of scratch paper when they arrive. This list should be placed next to the dish. This makes it easier for people with food allergies or sensitivities to enjoy the event too. Setup crew. Their duties will include wiping down tables, moving furniture, setting out plates and silverware, preparing drinks, and putting up decorations. Depending on the size of the venue and how much setup you need to do, expect this to take 1 to 2 hours for 2 to 4 people. Kitchen crew. If you’re doing cooking on-site, recruit additional volunteers to help with that. Leave plenty of time for food preparation and cooking time. Be sure the food is ready to serve by the time the guests arrive. Welcoming team. At least two people should be sitting at a table by the entrance to greet attendees. The table should be staffed throughout the event with volunteers who are friendly and outgoing. They will ask attendees to sign in, ask about ingredient lists, and tell people where to hang their coats, where to put their food, and where to sit. Hosts. Have a couple of volunteers make sure the food serving area is kept clean, water and coffee are supplied, and attendees are getting what they need to enjoy the event. Photographer. It’s useful to document your event to show your thriving veg community. You can use your photos for your website, email newsletter, and social media. Cleanup crew. Check with the venue in advance to see what their expectations for cleanup are. How many people you need will depend on how much of the cleanup you’re responsible for. Some venues may want you to wipe all the tables and mop the floor. Others may have fewer requirements. If you’re doing your own cooking or supplying washable dishes, make sure you have enough people to cover all of these duties. Add everyone to your contact database from the sign-in sheet. If they signed up for your email newsletter, add them to that. Post a note to social media thanking everyone for coming, and thank your volunteers with an email. If you received a donation from a food company, be sure to thank them as well. If you’re ambitious, you could create a survey for attendees using Google Forms or SurveyMonkey. Keep the survey short, just 3 to 4 questions. Include another opportunity for people to join your email newsletter list here too. In addition to the feedback you receive from attendees, make your own notes about what went well and what can be improved for the next potluck.